The technical specifications look pretty impressive. 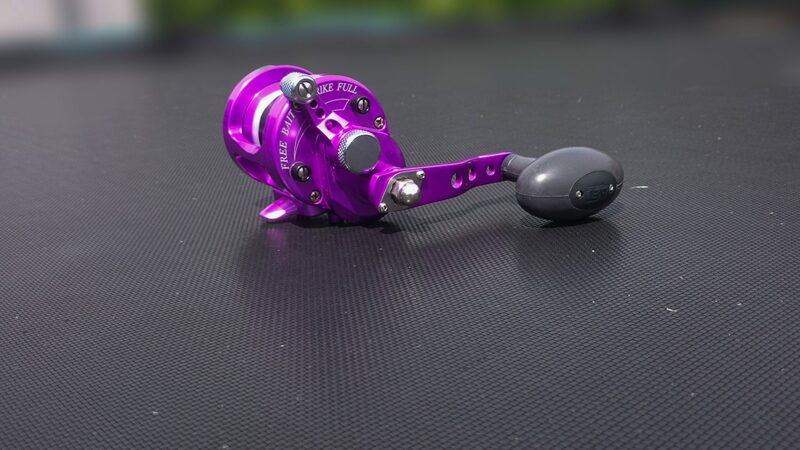 The reel is made from 6061 T-6 marine grade aluminium and stainless steel, The frame comes from a from a single block of alloy, this gives it greater strength and at only 14oz, it keeps the weight down. To finish the process the reel is anodised to give it a great look and corrosion resistance. Talking of finish you have a choice of 7 colours, I opted for something a little different and went for the purple. I think it brightens things up a bit and looks great in photographs. The Avet is similar in size to the Penn 525 and your average 6000 sized reel. It holds 320yds of 15lb line and has a retrieve ratio of 5.3:1. For complete security it comes with a matching clamp, that allows you to lock it firmly on the rod. It is fitted with a ratchet or alarm clicker as the manufacturers like to call it, which is ideal when fishing for larger fish. The first thing I noticed about the reel was it is a lever drag. Now I have never come across a lever drag casting multiplier before, so I was a bit sceptical despite being told that the MC in the title of the reel stood for Magic Cast. The lever drag comes preset from the factory at 9lb on the strike mode and 14lb on full lock, which controls the dry carbon fiber drags giving excellent stopping power, smoothness and wear resistance.You can if you like alter the pressure of both those points. When I first got the test version of the reel it was loaded with some monstrously thick mono. I tried a couple of casts with it. Despite the casts being very smooth I was very disappointed by the distance I could achieve. I reloaded it with 18lb Trabucco T-Force XPS Longcast which has a very low diameter of only 0.22mm. Not only was I using a line that I trust but because of its low diameter I could load a lot more on that just 320yds. Next session out I put a couple of lazy casts in to bed the line down, then let fly with a full blown pendulum with the magnetic brakes fully on. I was half expecting the reel to blow up on me, but not at all. The cast was exceptionally smooth. With increased confidence I turned the magnets down until I had them on the lowest setting. My casts flew out, I have no idea the actual distance but it looked further than when I used my Penn, it certainly was not any less. I am not sure if at the lowest setting the brakes are completely off or there is still a small level of braking. The reason I am unsure is that even at setting 1 the reel is super smooth when it is cast. If I turn the brakes right down on my Penn I would expect at least 3 out of 10 casts to birdsnest. I am not saying I have never had a birds nest with the Avet, but I think it has happened so infrequently in the past 4 months that I can’t remember the last time I did. This is by far the smoothest casting reel I have ever used, this I suspect it down to the 8 stainless steel bearings it runs on. Casting is obviously a major factor when considering any reel but how the reel performs over time and under pressure is equally important. I use the Avet almost every time I fish from the shore and occasions on the boat for Bream, Plaice and wrecking for Pollock. Once you have hooked into a decent fish then the powerful gearing takes over. The large comfortable handle allows you to crank in double figure Pollock with ease. The one thing I love more about this reel than anything else is the lever drag; I love lever drags. Almost all of my boat reels are lever drag, I like the ability to easily control how much pressure to put on a fish. 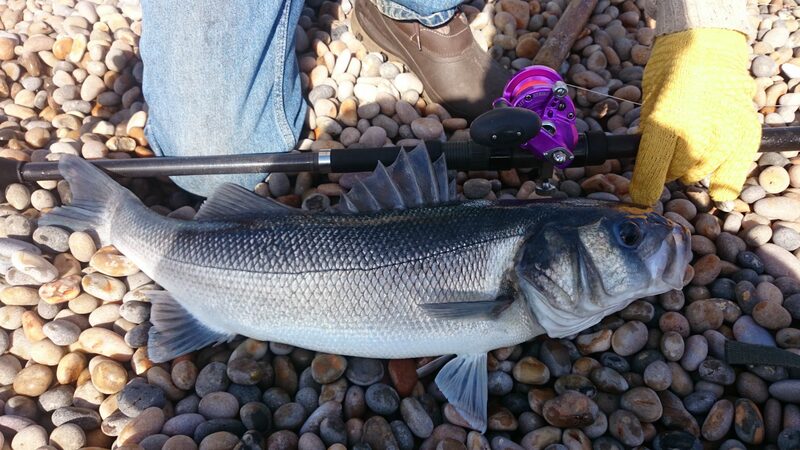 I have had several good Cod and Bass on it from the shore in fairly rough conditions. When you are bringing in that big fish and the surf grabs it to pull it back, you have to be able to slacken off the drag quickly and let it go back with the surf. or risk it being pulled off with the force of the water. 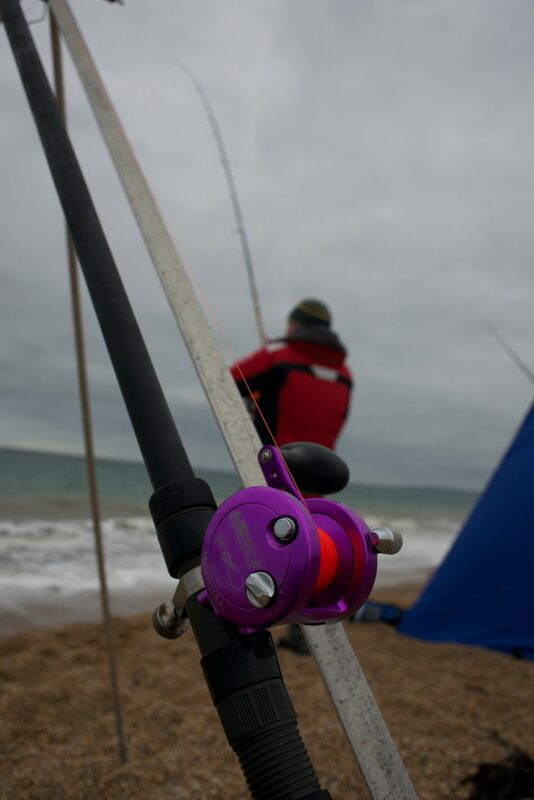 With a quick movement of the lever you can slacken off the drag to allow the fish to be pulled back under pressure then lock it up to crank the fish on to the beach. The drag is incredibly smooth and helped me tame this near 7lb Bass in a heavy surf. So almost every product we review has a downside. With the Avet SX I struggle to find one. It is not designed for the casting field, as those guys like their reels to be a bit more free running to get every inch they can out of them. 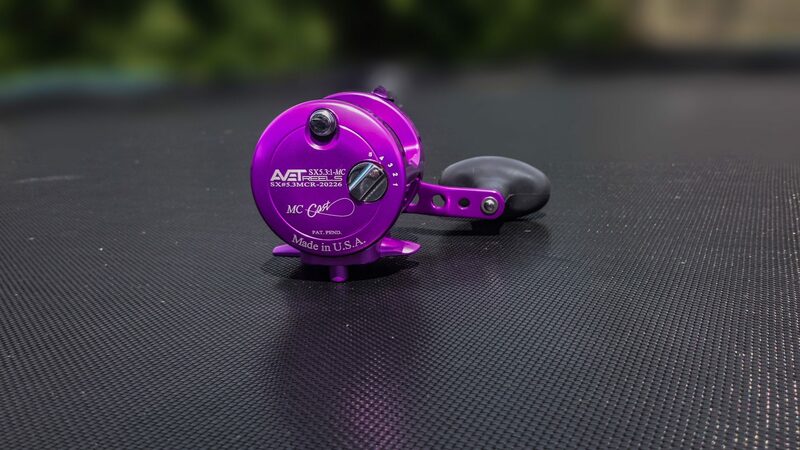 The Avet is an out and out fishing reel that will handle every wind condition and not give you a birds nest. Once you have hooked that fish at distance you have all the power you need to wind it back in. Would I recommend the Avet to anyone looking for a casting multiplier? The answer is a simple yes. Save up, pay the extra money and buy the best. 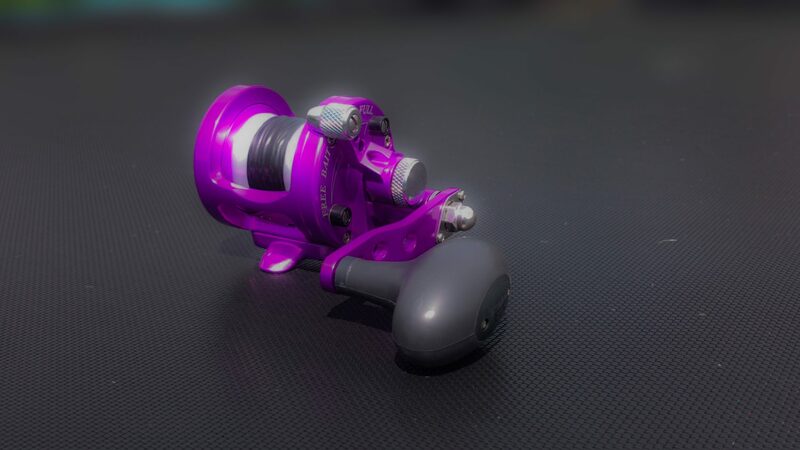 I love this reel, it is by far the smoothest and best looking casting multiplier I have used to date. It is just as at home for light boat work and the lever drag is a dream. 3 Responses to "Avet SX 5.3 MC Reel review"
I have had some MX , JX 8:1, LX and a couple of bigger for boat fishing. I have played with very thin / “strong” mono (mostly Spanish, Italian though the ‘nylon’ is been manufactured in Japan) and I STILL cannot decide if they are a good thing ….. how about the “18lb Trabucco T-Force XPS Longcast” I have some of the Trabucco tapered leader items, but not the XPS Longcast. What should I being testing in “a type of” the real world – when casting, using on rough (or “coral” tube-worm beds”) ground, breaking off (or not breaking too soon when stuck in rock), how well it tends to “fluff” or become a birdsnest at 50-80 metres – on a cast that will go to 150m if it does not fluff, and what else should I be test ? as Sean knows that I have only used “30 lb” braid or stronger when casting multipliers; if I try thinner (e.g. 0.25 mm) I have to slow the spool ….. until getting to the end of the cast.